The Oklahoma Policy Institute has published an insightful research brief that calls for more transparency regarding the state’s numerous tax exemptions. The brief, titled “Let There Be Light: Making Oklahoma’s Tax Expenditures More Transparent and Accountable,” points out the huge reduction in revenue because of the exemptions, which are known as tax expenditures. The Oklahoma Tax Commission (OTC) identifies over 450 separate provisions of state law that provide for some reduction in the amount of state taxes that would have been collected but for preferential tax treatment. The total cost of tax expenditures – at least $5.6 billion in FY ’08 – equals more than 75 per-cent of total state appropriations and grew by over $1 billion, or 23 percent, in just two years. OK Policy argues that these tax expenditures should be more transparent and also reviewed, especially given the state’s current budget crisis. Are the tax exemptions effective? States often use tax breaks as an incentive for economic development, but sometimes these breaks are not needed or become unnecessary as time goes on. Now is obviously a good time to take a closer look at these tax breaks and see if they’re working. 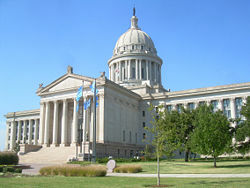 State Sen. Tom Adelson, a Tulsa Democrat, has pointed out the state could save $259 million by ending some tax credits. He has also argued that tax exemptions to oil and gas producers do not provide incentive. This echoes comments by George Kaiser, a Tulsa oil executive and well-known philanthropist, who said new wells would be drilled even if the exemptions weren’t in place. Energy companies are going to go where the oil and gas is regardless of how many tax breaks they get in doing so. Last year, I wrote about Kaiser’s comments and the whole concept of “trickle-down” economics here. The “trickle-down” theory of economics was finally repudiated under the President George Bush administration, which left the country with its worst economic crisis since the Great Depression. Let me repeat this: Tax cuts given to rich people don’t stimulate the economy; they simply make rich people richer. The economy always does better when government invests in its people and infrastructure. Update: Scott Cooper has published an excellent story about the issue this week in the Oklahoma Gazette.